** If you don't leave your thigh measurement in the Note section, standard garter set will be made & shipped to you. My standard garters stretch to 20 inches. **All Garter orders will be shipped by USPS First Class Mail (Transit time normally takes 2~ 5 business days). If you need it sooner, please convo with me. 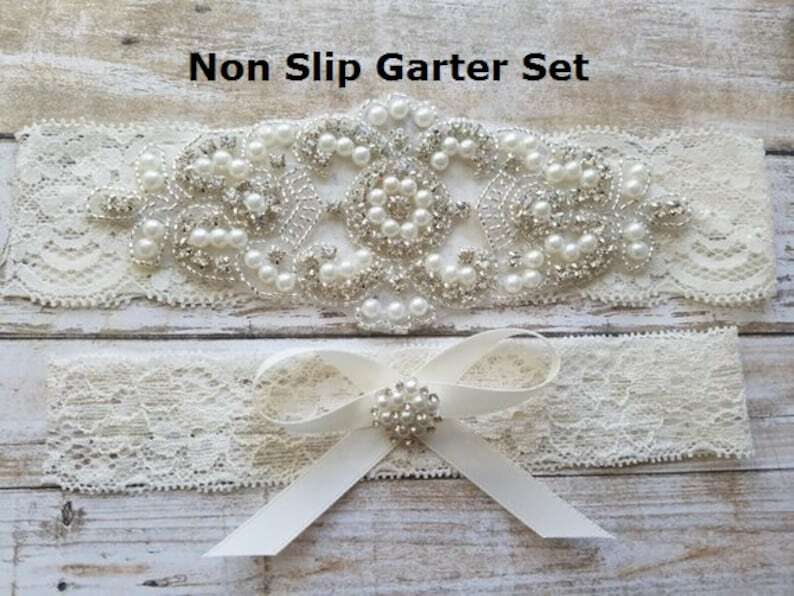 This Bridal Garter & Toss Garter set will make your special day unforgettable & memorable! I bought this for my future daughter-in-law and gave it to her this last weekend and she absolutely loved it. Shipped on time and came in perfect timing. My only problem is that it has a very bad smell! So now I have to figure out how to wash it without it getting messed up! Other than that it would have been 5 stars because it is very beautiful! or PayPal . Thank you so much for you support! ***Returns and exchanges are accepted within 3 days of delivery. Due to the nature of handmade items, a 20% restocking fee will be applied. ***No shipping fees will be reimbursed and the buyer must be responsible for all shipping costs. ***Garters - All sales are final. Garters are considered intimate apparel & we won't be able to do an exchange nor accept returns. All sales are final, so please ensure to provide your accurate thigh measurement during your checkout! ***Belts/sashes - If for some reason, you do decide you want a different item or color I am happy to work with you to do an exchange but the item MUST be in brand new condition & must be retunred back to us within 3 days of delivery. Buyer is responsible for all shipping charges and must place a new order for replacement. I ship via USPS to offer you the most economical shipping method possible. When your item ships you will receive an email via Etsy with the parcel number. USPS offers tracking numbers. It may not show or be updated within their system even though it has shipped. It may also be a few days from when you received the email to when the tracking is updated. If you want to purchase insurance you may do so by contacting me prior to ordering. ALL LOST, STOLEN OR RETURNED packages paid without insurance are the responsibility of the buyer. USPS failures are not my fault or a reflection on my level of dedication to my customers. However, if you have any questions concerning this matter, I’m willing to work with you, so please convo with me. If your package is shipping internationally, delivery can take anywhere from 2-4 weeks. Your tracking number may or may not update after the package has left the US, depending on your country's postal policies. Customers are responsible for any customs & duty fees imposed by their country. Please be aware - we are not responsible for lost, stolen, delayed, damaged, or missing packages, once the item has shipped. In the event that your package is lost, we can offer replacements at 50% off. I will ship to the ship to address listed in the order confirmation. Any packages returned due to wrong/incorrect address will be reshipped at the cost of customers. Thank you so much for your support & if you have any questions, please convo with me. Please know that due to the way I process my orders cancelation requests will not be processed so please double check before you order! Once an order is placed it will ship.